This weekend, my office hosted a baby shower for one of our co-workers. 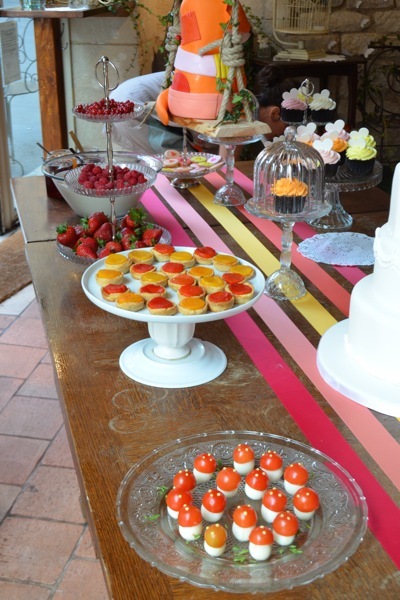 It being a baby shower, everything was small, cute, and color-coordinated, including the food. My contribution? These polka-dot mini-quiches. While exceedingly simple, these quiches can be whipped up in a flash, with minimal fuss. They are endlessly adaptable – the shape/size, fillings, and toppings can all be changed. 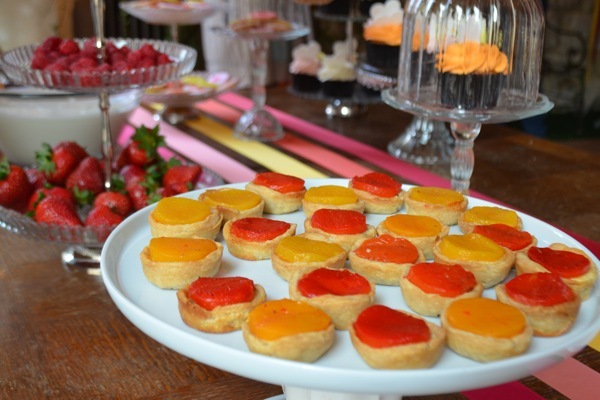 For the baby shower I used mini-quiche cups, a plain filling, and topped them with roasted red and yellow peppers. I later used the same recipe for lunch, serving one nine-inch quiche filled with spicy Roquette greens, prosciutto, and Emmental cheese. The savory filling will make one 8 or 9-inch quiche. It can be combined with almost anything – roasted peppers, caramelized onions, cheeses, blanched broccoli, carrots, fresh spinach, sausages, pre-cooked meats, chopped fresh or dried herbs, etc. Just make sure that whatever you add has already been cooked, or only needs very light cooking. To make the crust, combine flour, salt, pepper and butter in food processer till the mixture resembles coarse crumbs (or cut butter into dry ingredients with a fork or your fingers). Form dough into a small disk and wrap with plastic wrap. Chill in fridge for at least 1 hour, and up to a few days (dough can be frozen at this point; it will last for months). To make the filling, whisk together cheese and butter until well blended. Add the eggs one by one, mixing well after each addition. Stir in the milk, cream, salt, pepper, and any herbs. To assemble the quiche, preheat oven to 400°F. Roll the dough to 1/8 inch thick and 1-inch larger than your pan. Line the pan with dough, and press dough into sides of pan. Prick the bottom of the dough with a fork a few times. Cover the dough with parchment paper, and place pie weights (or uncooked rice/beans) on top of parchment, making sure to add enough weights to support the sides of your dough. Place the crust in the oven and bake for 10 minutes. Remove from the oven, and let cool. Lower oven temperature to 375°F. Remove beans and parchment. Add any fillings (pre-cooked veggies, pre-cooked meats, or cheeses) and pour in the egg filling. Place in oven and cook 20-25 minutes, until the egg is set and beginning to brown. The mini-quiches are so colorful and pretty! What a great idea for a party!